When we first got our new stock from the Design Studio on the reservation in New Mexico, we were delighted with the design and colours in this elegant little teardrop pendant. 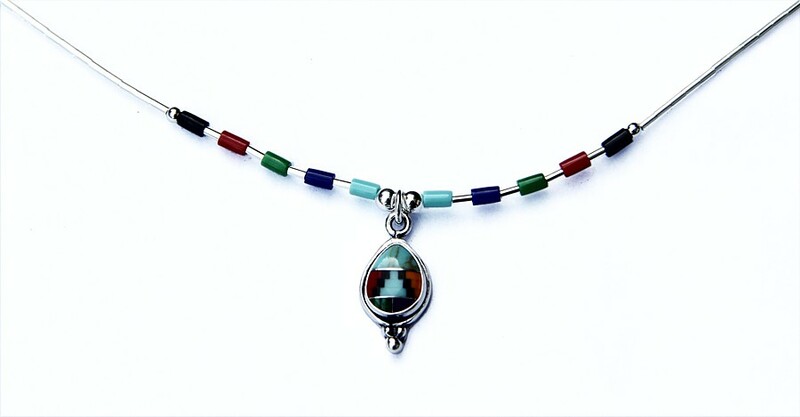 We also liked the way the designer has intricately inlaid the turquoise within the other semi-precious stones to form an arrow - obviously highly significant in Navajo culture. The teardrop has then been on an ornate sterling silver surround and threaded onto a Sterling Liquid Silver "chain" complete with semi precious beads and globes. Length: 41cm (16") Heart: 1.5cm (¾") Matching earrings available.